The Pyramidal Arborvitae Nigra has dark green foliage that persists through the winter. It is insect and disease resistant and available in 4′ – 14′ (basket size ranges 22″ – 50/60”). 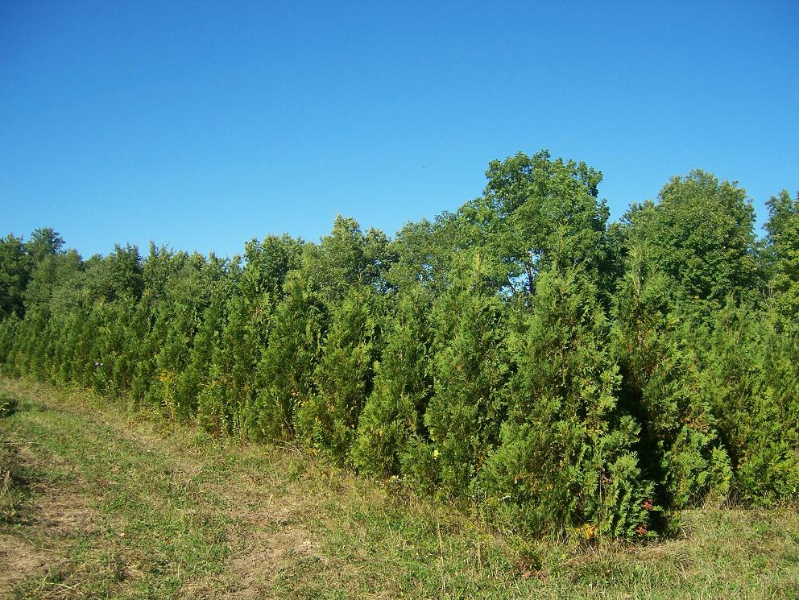 Emerald Green Pyramidal Arborvitaes grow 10 – 15 feet in height with a spread of 3 – 4 feet. They have a bright emerald green color all year long and do not discolor in the winter months. They can be spaced 2 – 3 feet apart to create a windbreak or visual barrier. Available in 4′ – 7′ (basket size ranges 22″ – 32″). Hemlock Trees grow up to 70 feet high with a spread of around 35 feet. Hemlocks like moist, organic well drained soil. The Hemlock does very well in rocky bluffs or sandy soil and tolerates shade well. Available in sizes ranging from 4 feet – 12 feet (basket size 22″ – 42/48″). The Japanese Larch (Larix Leptolepsis) is generally described as a perennial tree. The Japanese Larch (Kaempferi) has a long life span relative to most other plant species and a rapid growth rate. Available in 4′ – 26′ (basket size 22″ – 80″). The Turkish Fir tree is native to Turkey and found in the mountains west and east of the Black Sea. It is a large evergreen with attractive foliage that consists of flattened needle-like leaves. The Turkish fir is becoming a popular Christmas tree because the strong branches are able to hold heavier ornaments and the needles remain on the tree longer if watered properly. The Balsam fir prefers moist, well drained, acidic soil. It adapts well to cooler climates. 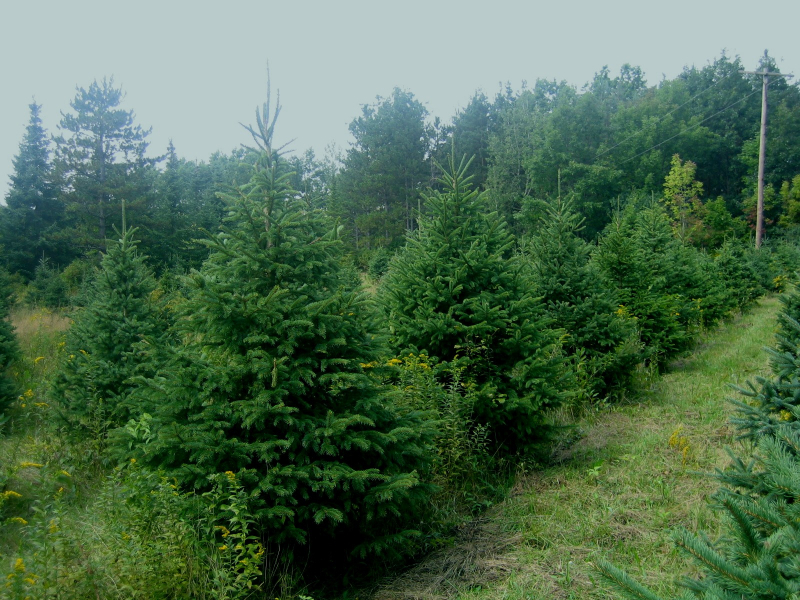 The Balsam Fir is extensively used for Christmas trees and ornaments and needs very little shearing. Sizes range from 4′ – 10′ (basket size 22″ – 34/38″). The Concolor Fir, also known as the White Fir, provides a decorative contrast to darker-colored evergreens. It’s a popular Christmas tree because of the natural “orange” aroma. Available in sizes 4′ – 8′ and 18′ – 26′ (basket sizes 22″ – 32/34″ and 60/72″ – 80″). 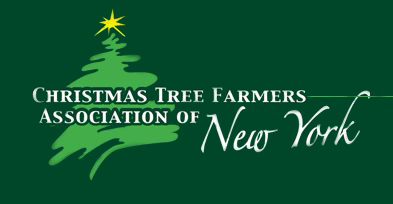 The Fraser Fir serves as both an ornamental tree and a highly sought after Christmas tree. The tree grows up to 60 feet tall and 25 feet in diameter, providing a compact appearance. Available in 4′ – 8′ (basket size 22″ – 32/34″). The Grand Fir is slow growing and shade tolerant. This beautiful evergreen produces few cones. Needles are flat with rounded and notched ends. Available in sizes ranging from 4 feet – 8 feet (basket size 22″ – 32/34″). 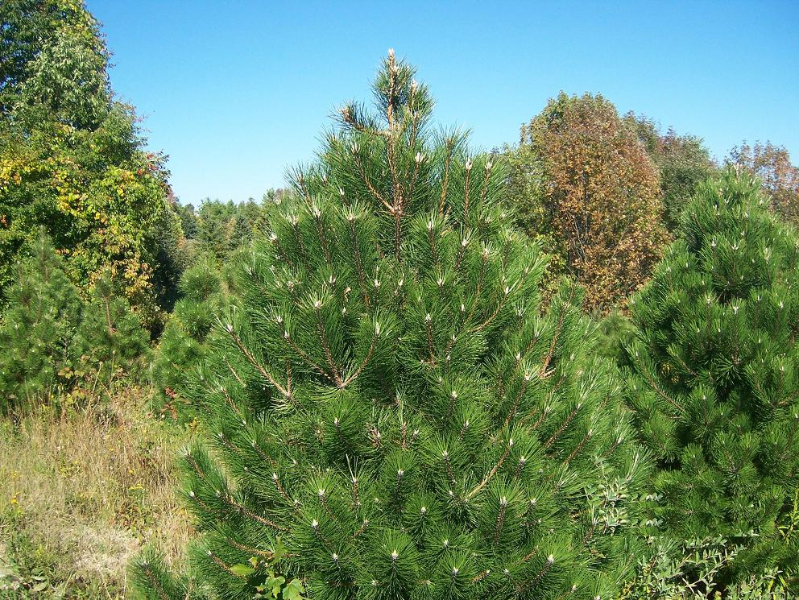 Red Pine can be used in the landscape as a specimen tree, a screening tree, or a windbreak tree. Red Pines grow up to 75 feet high with a spread of 15-20 feet. The needles are medium to dark green and soft. Available in 4′ – 6′ and 10′ – 16′(basket size 22″ – 28″ and 34/38″ – 60/72″). The White Pine grows well in large spaces and may reach sizes over 100 feet tall. It’s also commonly used as a Christmas tree. Sizes available 4′ – 16′ (basket size 22″ – 60/72″). Meyer Spruce trees are similar to the Colorado Blue Spruce, but closely related to the Dragon Spruce from western China. They are a medium size evergreen with cylindric cones that are occasionally used as ornamental trees. The Meyer Spruce grows slowly the first couple of years but once established the growth rate is also similar to the Colorado Blue Spruce. 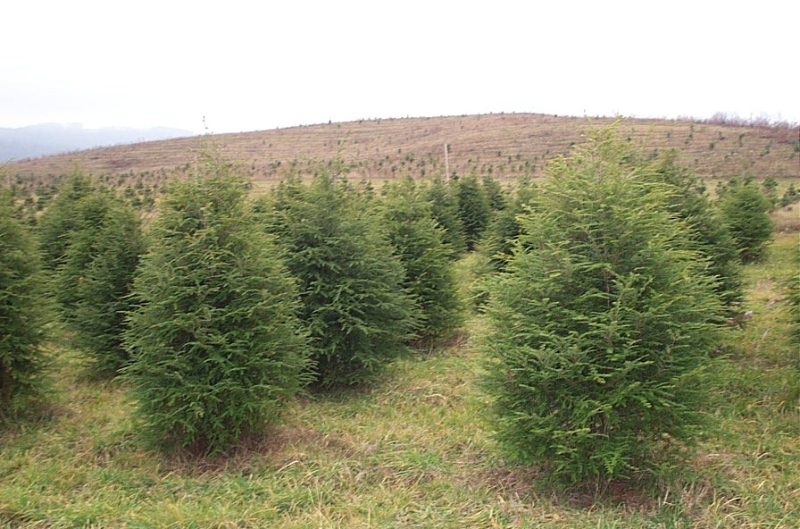 Meyer Spruce grow well in a wide variety of soils. Meyer Spruce trees are becoming more popular in the United States because they are more disease resistant than the Colorado Blue Spruce. The Black Hills Spruce are dense trees that commonly used for privacy, wind breaks or accents. They hardy spruce that fairs well over the winter, and they’re not well liked by deer. Available in 4 feet – 8 feet (basket size 22″ – 32/34″). 4 ‘ – 12′ and 18’ – 26″ (basket size 22″ – 42/48″ and 60/72″ – 80″). 20′ – 26′ (basket sizes 22″ – 50/60″ and 72/80″ – 80″). The Serbian Spruce can grow up to 50 feet. They stay compact and dense and need very little shearing. The Serbian Spruce has needles that are short and soft with a glossy dark green on top. Available in 4′ – 10′ (basket size 22″ – 34/38″). The Engelmann Spruce grows up to 90 feet high averaging about 30 inches in diameter. They have needle-like leaves, that are about 1 inch long, blue-green in color, stiff, sharp-pointed, and square in cross-section. Sizes range from 4 feet – 7 feet (basket size 22″ – 32″). 4′ – 14′ and 20′ – 26′ (basket size 22″ – 50/60″ and 72/80″ – 80″). 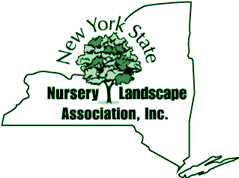 *Tree Size – All trees are measured according to American Association of Nurserymen. Tagging by customer is encouraged. Updated on 2016-08-23T16:58:16+00:00, by admin.